I’m delighted to have the lovely Nancy Lee Badger visiting my blog today. You’re in for a treat, since she’s sharing her wonderful story, My Banished Highlander from this fabulous boxed set called, Medieval Redemption. Yet, before I tempt you with the blurb and excerpt, let’s chat with Nancy. Grab a cup of mead, ’tis on the house today, or your favorite beverage and get comfy. MM: Welcome, Nancy! So thrilled to have you here today. Describe a typical writing day. Are you a morning, afternoon, or night-owl writer? NLB: I am a fulltime writer, and I seem to do my best organizational work in the morning…checking emails, birthdays on Facebook, blog articles going live, etc. Once I get hubby off to work, and these necessities are behind me, I am free to write. This doesn’t happen every day this way, of course, but I always hope for the best. MM: Ahh…understand. Sometimes we have to allow for those interruptions, or in my case, computer issues. Can you tell us about your current work-in-progress? 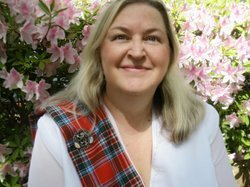 NLB: I recently submitted a Scottish historical romance to a publisher. It takes place during 1816, and my hero has recently returned, wounded, from the Battle of Waterloo. He’s half English lord, and half heir to a Scottish laird’s castle, so he’s torn. Should he follow in his dead father’s footsteps, or his Scottish mother’s? Unlike my popular stories, there is no time travel, no witchcraft, and no dragons, but there is plenty of action and spicy romance. Until it sells, I am outlining several books that will follow other characters in the book. Think series! MM: I’m positive that it will soar, Nancy! And I’m a huge fan of series. What inspires you when you’re writing? NLB: That’s a good question. When I am writing, I am in charge of my life, good or bad. I miss the steady paychecks, but not working under difficult circumstances. My last job was as a 911 emergency medical dispatcher, so the stress of the calls and the pressure not to kill anyone was always there. I enjoyed volunteering at Scottish Highland games in New England, so began to focus on writing about that culture. MM: Wow! I applaud you for at least working in that type of job. As for the Highland Games…they’re the best! What’s your favorite item on your writing desk? 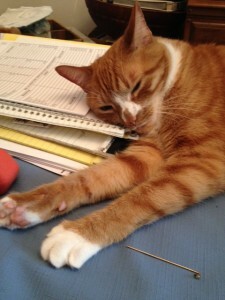 NLB: My cat, Blaze. No matter where I am writing…the office, the den where NASCAR is running on the widescreen, or in the den where I can spread out my maps and research papers, he is nearby. He loves to sit on the paper I need the most. MM: He’s adorable! Thanks for sharing him with us! Southern drawl or Scottish burr? Scottish burr! Kilt or Leather pants? Kilt! I own one, hubby owns two (two clans), and each son owns one. Print book or e-reader? I love print books, as my overflowing bookshelves can attest, but my e-reader is easier on the eyes because I can make the print BIG. Thanks so much for taking the time to visit us here today, Nancy. I’m wishing you all the best with Medieval Redemption! When his clan convicts Cameron Robeson of treason in 1598 Scotland, the last thing he thought his cousin the Laird would do was banish him to the future. With a certain woman on his mind, he plans revenge. Iona Mackenzie is worried about her friend, Haven, and searches for answers among the tents at the present-day Highland games. Whom can she trust to help? The tall, golden-haired Highlander? When a magical amulet and an angry sorcerer send this unlikely couple back through time, more than one heart will be broken. Danger, intrigue, and threats surround them, and feelings between Iona and Cameron grow hot and steamy. Cameron’s cheeks warmed as a smile tugged at the corner of his mouth. Blood flowed from one man’s nose as the other, rolling in pain, fought to regain the ability to breathe. Finally freed, and of her own accord, Iona grabbed her satchel then flung herself into Cameron’s chest. He slid the sword back over his shoulder and into its sheath, then grasped her with his right arm as he kept the dirk at the ready. He backed her into the forest. Once hidden by the trees, they headed toward their original destination. When angry voices rose behind them, gaining, he pulled her off the main trail. He followed what he assumed was a deer trail. Keeping her tight to his chest, he fought the desire welling up. Was it due to fear for her safety, or amazement at her courage? Her sultry fragrance filled his nostrils. With their lives in danger, why did the urge to throw her up against the nearest tree make him angry? He pushed her aside. She tripped. “Aye, lass?” he asked, gathering her again into his arms. He accepted her gratitude with a nod, then planted a chaste kiss upon her temple’s smooth, pale skin. She shuddered, so he held her tighter. Soft curves melted into his side, warming his own chilled flesh. Cameron was smart enough to realize she was scared. Even so, she had fought like a warrior. When three strange men had threatened her life, and her body, his breath had caught. When he saw their hands upon her, his heart had stopped. When the man with the knife charged him, she initiated her release from the others. The feeling sweeping through him was pride. Pride? In a woman who tripped over roots, spoke spells incorrectly, and drove him insane with her sweet smell? What a wonderful blurb. You have a gift with words. And I love time travel and magic. I also love the picture of your cat. I think it must be a cat thing to always lie on what we most need! You must check out Nancy’s other books, too. I was thrilled she shared a picture of her cat. Precious! Thank you so much! I try to write what I would like to hear, with enough description to form a vision in my readers’ heads. Kilts rule!!! Plus, you’ll pick up some other fabulous stories, too, Sharon. Mary is right. 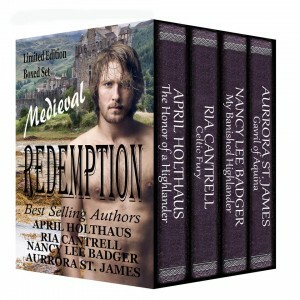 Medieval Redemption has four full-length books, so many hours of great reading! Thanks for stopping by. Just bought Medieval Redemption and looking forward to diving into the stories. Yes, thanks Mickey! I hope you enjoy over 1,000 pages of bad boys in need of redemption. Great blurb , I enjoyed the interview with Nancy Lee too. I will get the set of books as well–love Ria ‘ s work as much as Nancy’s . Awesome news, Suzie! A wonderful collection at a great price.